Among the many items on the West Hollywood City Council’s agenda tonight is a discussion of the possibility of the city purchasing the Gelson’s Market site at 8330 Santa Monica Blvd. That item is on the Council’s “closed session” agenda, which is reserved for legally or otherwise sensitive matters that don’t have to be discussed publicly under the state’s Brown Act. In an interview with WEHOville, Yvonne Manganaro, who is the senior director of marketing for the California food store company, said Gelson’s now manages 27 stores, 24 of which are in physical spaces owned by others. She said Gelson’s wants to get out of the real estate business by selling the property in which its West Hollywood, Pacific Palisades and Calabasas stores are located. However, Manganaro said, Gelson’s does not intend to leave West Hollywood. “We’re looking for a long term lease arrangement with options (to renew),” she said. Manganaro noted that high real estate prices in West Hollywood make this an optimal time to sell the grocery store site and building. Thus far, she said, more than a dozen entities have reached out to inquire about buying the three properties that are on the market. The City of West Hollywood has effectively expanded City Hall by renting space in the Koontz Hardware building on Santa Monica Boulevard to house some employees and putting us in the Werle Building on Robertson Boulevard. It also has purchased several commercial properties in recent years, including the lot that once was to house a Walgreen’s pharmacy on the southwest corner of Santa Monica and Crescent Heights boulevards, which the city intends to use temporarily as a parking lot until it can decide a long term use. And it now owns the Coast Playhouse at 8325 Santa Monica Blvd., which it intends to use as a performance space. 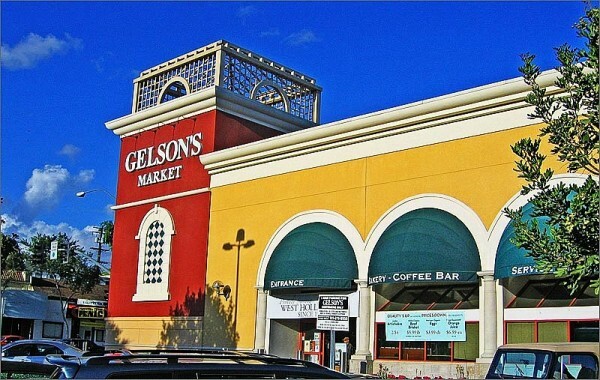 Gelson’s Markets, founded in 1951, is owned by Arden Group Inc., an entity headquartered in California that itself is controlled by TPG, a global private investment firm headquartered in San Francisco. West Hollywood is home to nine traditional grocery stores: Bristol Farms, Gelson’s, Pavilions, Ralph’s (2 locations), Smart & Final, Trader Joe’s (2 locations), Whole Foods Market. It also is the location of stores more focused on home delivery such as Pink Dot and Yummy and stores like Odessa, the Russian-market, with an ethic focus. Citizens Agenda: What Can WeHo Do About Homelessness and Traffic? Despite most Gelson’s are known for High End and Very High Prices, our Gelson’s is a Vital Local Resource for basic Groceries. With the very densely populated Kings road and other nearby streets, with many who are elderly, and walk to Gelson’s and that’s a big deal, for basic groceries. BTW – anyone needing groceries – I found Vons.com (pavillions) has an AWESOME HOME DELIVERY SERVICE. The first order is free delivery. But you can always find “free delivery” with their site deals/offers. Great if disabled. Will bring and carry up heavy things: water, beverages, canned goods. Flawless service for years, in my experience. Gelsons adds tremendously to the walk ability of the neighborhood. If the city purchases the building it will only be a matter of time before they evict the market to expand city hall. It would be a blow to the neighborhood to lose this resource. Let’s ask the LA Times how well selling Times Mirror Square then leasing it worked out for them..
Doesn’t make sense to me to sell the building if you want to stay in West Hollywood. Who sells their home only to rent it back. Rents rise along with costs and before long it won’t make sense to keep renting the space you once owned. No matter what happens, I really hope they stay in West Hollywood. Love that store. Arden Group has always been headquartered in California; you are confusing Arden Realty, which is headquartered in Philadelphia, with Arden Group. Thanks for alerting us to that error. The story has been corrected. Let’s understand what is happening here. First, Gelson’s West Hollywood is a gold mine. That store is always busy and the high-margin prepared food/deli department is the busiest. It’s been there for decades. People love it. Why sell the real estate now? Look no further than its ultimate owner, a private investment company. That company cares ONLY about the value of the real estate, not the value of a tiny supermarket chain. The pattern is very familiar to retail. The “valuable” assets like real estate are sold. Does that money go back to the business to invest in new locations, bolster a pension plan or improve a service? No, it’s stripped out by the owners. Rent gets jacked up, significantly reducing the profit of the retailer (supermarket in this case). Eventually, all valuable assets will be stripped out of Arden, it will be stuffed with debt and then thrown back on the public market or sold to a much larger company like Whole Foods or Kroger. The private equity group never cared about the business, only its underlying assets. Pick it clean and toss the bones overboard. Familiar vulture capitalism. Any purchaser of that valuable piece of real estate will NOT want to be a landlord to a supermarket, no matter how easy it is to collect a rent check. The property will be sold to a developer who’s only intent will be to demolish the supermarket and build pricey condos or very over-priced rental units. We’ve seen this pattern over and over again all around West Hollywood. I believe that Gelson’s wants to remain where it is. I just don’t believe that management of the grocery store thought it was a great idea to toss one of its last valuable assets so it could pay huge triple-net rent payments to a new landlord. Whoever buys the property will want to redevelop it, no matter what it says to the sellers in order to get their hands on the property. I’d rather see the City buy it and eventually expand City Hall to that location. The City enjoys a very low cost of borrowing funds right now and this would be an asset that would hold value and likely significantly appreciate. Better than another luxury housing project that few current residents could afford. This corner lot was never a Walgreens but was instead a vibrant strip mall for many years. Walgreens purchased the lot and demolished the strip mall in the hope of getting approval to erect a large multi-story mixed use building. They proposed a pharmacy on the ground floor. The project was scuttled by the discovery of an underground toxic site the developers failed to disclose to regulators. It was discovered by a consultant hired by local residents who opposed the development which they felt was out of scale for the neighborhood. I don’t know about hiring a consultant. But you can google the street address and look for the public records about the property site. It had (I believe) 26 known toxic issues. Don’t you mean 2 Trader Joe’s? Good catch! Thanks for that. The story has been corrected too note that there are, in fact, two Trader Joe’s. What’s the update on the city utilizing the former Aaron Brothers location (7500 sq ft) since the city already owns this building? I hope they don’t sell to the city. If Steve Martin had not blocked it, City Hall would have been over with the library, at West Hollywood Park. It would have made a lot more sense over there, and there would have been plenty of room, and we would not have needed the 20 million dollar parking garage. Very short-sighted. Anyway, leave Gelson’s alone! Is Sprouts on LaBrea in West Hollywood? No, but there is a Sprouts location being built right next to 24 Hr. Fitness smack in the middle of WeHo. Other than a Sprouts what else is going into that new building? There was talk at one time of a new gym opening in that space? If so ….. goodbye 24!! !